If your knee is weak, swollen, painful or recovering from an injury, Bauerfeind’s GenuTrain P3 knee support provides relief and stability for the knee joint. GenuTrain P3’s medical-grade compression relieves pain, heightens proprioceptive bio-feedback, and protects the joint without limiting your mobility. More than 80 years ago, Bauerfeind set the bar for compression technology and we’ve been raising it ever since. Because of our medical heritage and attention to detail, our products still lead the industry in fit, comfort, support and performance. Endorsed by the Arthritis Foundation, NBATA (National Basketball Athletic Trainers Association), and PBATS (Professional Baseball Athletic Trainers Society), and the 2008-2016 Olympic Games, Bauerfeind’s GenuTrain knee support is trusted by professional athletes and healthcare providers throughout the world. 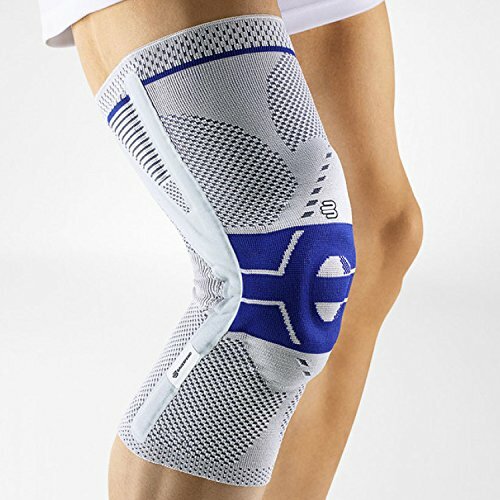 Whether you are a serious athlete or an active person who doesn’t want pain or injury to interfere with the things you love to do, Bauerfeind’s GenuTrain P3 knee support is for you. Be comfortable and active with GenuTrain. Bauerfeind Perfect Fit sizing system - Please measure according to the size chart provided. If you are in between sizes, you should typically go with your thigh size. GenuTrain P3 knee brace is designed to relieve pain for misalignment of the kneecap. Using a corrective strap, the integrated ring-shaped pad holds the kneecap securely in a natural, central position and prevents drifting. Bauerfeind's knitted fabric is soft, breathable and moisture-wicking. The Perfect Fit sizing system goes beyond small, medium and large for a comfortable fit that stays in place all day with the proper amount of compression. Incorporated viscoelastic Omega pad surrounds the kneecap (patella) to relieve pain and provide massaging pressure. If you have a tight IT band, the P3 support helps relax the muscles on the outside of the thigh to relieve pain.